There was a time when most of the writers I knew, including myself, were introverts. We didn’t much care to leave the house, so staying handcuffed to a computer and surrounded by books instead of people was what we looked forward to. Are you enjoying this article? Take a moment to repin — you never know when you might need these tips again!! But it’s not that we didn’t want to be around people. It’s sometimes exhausting trying to be around people. Who would guess that the person with so many stories to write has so few words to say to people? The only real way to recharge our batteries is to get some alone time. And for some of us, that’s just not possible. Alone time is just a pipe dream. However, now, alone time isn’t even that anymore. A generation ago, writers did what they did best – they wrote. Editors edited, proofreaders proofread. And promoters promoted and publishers published. And agents… Agented? No… Agents represented writers so that writers didn’t have to spend the time doing all that other stuff. Now, it seems as though not only do writers need to start wearing new hats (and finding the time to perform the duties each of those hats entails) but they have to know how to do a lot more than writing. Editing, promotions, sales, in some cases even publication and getting stores to carry the book. Now, it’s true some of the methods used are not necessarily right in people’s faces. A lot of authors use Twitter or Facebook to help promote their books. Most start even before their book has been published yet. Social media has left an indelible mark on the world of writing. Even ghostwriters, like myself, who make a living out of being invisible need to get over onto social media and make their presence known. And it’s not enough to be on social media. Not only do you need an online presence, but you have to make that presence known. Once you decide to become a writer, it becomes your responsibility to make sure readers know who you are. And more and more writers are flocking to the world of social media, setting up their platforms and their profiles. Some more spammy than others. Some a bit more brazen. And what I’ve noticed? The longer they sit on social media, the louder and more talkative they seem to get. Or the majority of writers today are no longer introverts and so promoting their work isn’t quite the chore for them as it is for me. This was awesome, Naomi, and so spot on. When I first heard about this author platform thingy, I about crapped my pants. I hadn't been on social media for a couple of years and it wasn't with any other purpose than because everyone else had jumped off that bridge–and I followed along like a little lemming. This time though, the purpose was completely different and would involve tapping strangers on their virtual shoulders and starting a conversation. YIKES! 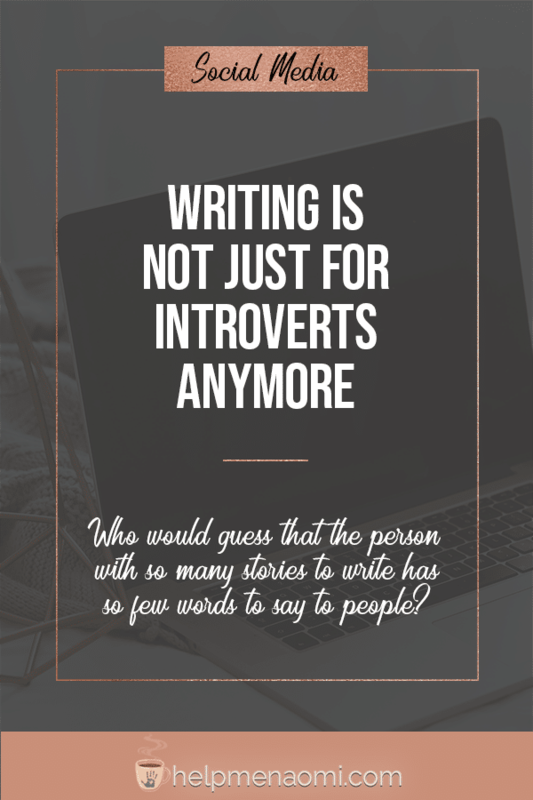 I think most of us are still introverts (my opinion anyway) but our desire to be successful writers out ways our discomfort at trying to socialize. Well at least some of the time. I still have trouble but I know I don't have a choice if I want to be noticed for my writing. Hopefully over time it will get easier. There is definitely a better-than-strong chance that the writing world is full of introverts who are uncomfortable but trying their best to work through it. It would still mean that the realm of writing is favoring exrovertic (is that even a word?) behavior… But we can always try to fake it until we make it, right? I'm an introvert…but Facebook and Twitter are different. Is that weird? I don't think about the faces on the other side of the screen. In fact, I know many introverts who seem to thrive online. Back in the MySpace days, I met a guy who NEVER leaves his apartment (works from home) but he was Mr. Cool online. You'd never know it. Going out in public definitely drains me…but I can be Miss Popular online! OMG going to events and standing up in front of people talking about my book? I dread it for DAYS but I do it because we're supposed to. Thank God we live in an era where we can do a lot of our publicity from our computers!